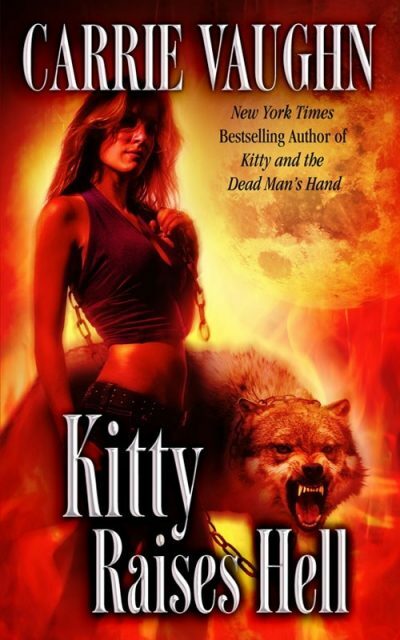 2009’s Kitty Raises Hell is the sixth book in Carrie Vaughn’s Kitty Norville series. Werewolves Kitty and Ben not only survived a Las Vegas’ infestation of cultists (as recounted in the previous volume in the series), they even managed to find a minister to marry them. Having succeeded in their main goal, the newlyweds return to Denver, determined to put Las Vegas and its monsters behind them. Las Vegas’ monsters are unwilling to return the favour. Focused on her career and her marriage, Kitty overlooks early hints that something untoward has followed her back to Denver. All too soon she has no choice but to take heed. Although Kitty and her friends escape with their lives, something… an ifrit … nearly burns her restaurant to the ground. Nor is Kitty’s new tormentor satisfied with mere property damage. One member of her pack refuses to embrace any form of magical defence. His friends find his charred body. While Kitty’s charms protect her and her pack for the moment, how long before their stalker finds a way to circumvent her magical defenses? Enter Roman, a vampire of uncertain age and unusual magical ability. Roman claims to be able to control entities like the ifrit. This may well be true. Roman’s appearance so soon after the arrival of the ifrit suggests that he may have some connection to such entities. However … Roman may not be an ally. He may have been sent by the Las Vegas group that Kitty crossed in Kitty and the Dead Man’s Hand. But even if he has been sent to win Kitty over and then betray her, he may be a link to the group, Kitty might learn something useful. When the lives of Kitty and her loved ones are at stake, can she afford to say turn him down? Many readers may wonder “What are the insurance implications of supernatural entities being a perfectly sensible explanation for calamities?” Do standard insurance agreements cover restaurants set aflame by ifrits, valuable keepsakes lost in dimensional pockets, or even floor damage caused by werewolf claws? This novel (indeed, the series as a whole) does not really address that pressing issue. Perhaps some other author could explore the intersection of insurance and the supernatural. I’ve kvetched about the outsize role of coincidence in the unwinding of plot when reviewing other series, so, to be fair, I should acknowledge that this book, like so many, depends on coincidence. Just when Kitty needs them, she coincidentally runs into a team of psychic detectives. She also receives help from the magicians she conveniently encountered in Kitty and the Dead Man’s Hand. All this isn’t quite as coincidental as running into the Emperor of Barrayar in the middle of nowhere. Kitty’s job and now hobby involves actively seeking out and interviewing vampires, werewolves, psychics, and the like. If she didn’t have a talent for finding common ground with people (and thus winning convenient allies) she would be a terrible interviewer. I suppose the lesson here is that if you are going to embark on a career that may compel you to fight monsters, try hard to have the applicable skills. Or mutant superpower. This is a fairly straightforward entry in the series, presenting Kitty with a well-defined challenge she needs to meet if she is to survive. It also adds to the largescale conflict the books would seem to have been setting up, but without undermining the book’s ability to stand on its own. New readers should probably start with the first book in the series, but … if the previous books are unavailable or unappealing, this book would be a good place to start. Much preferable to books that are mere fragments of vast, perhaps never to be finished, works in progress. Kitty Raises Hell is available here (Amazon) and here (Chapters-Indigo).